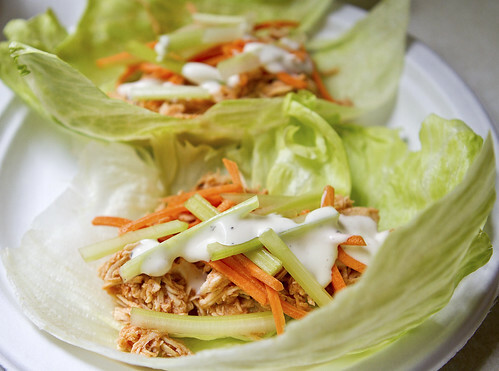 I was looking for a crock pot meal a couple weeks ago and came across these on Skinnytaste. They looked like a perfect summer crock pot meal (unlike the soup I'm making tonight...oh well :-) and really hit the spot. The chicken was spicy but paired perfectly with the cool crisp lettuce leaves and veggies. We used light ranch in ours since we had that on hand and I made quesadillas with the leftover chicken the next day for lunches. Super yummy!!! In a crock pot, combine chicken, onions, celery stalk, garlic and broth (enough to cover your chicken, use water if the can of broth isn't enough). Cover and cook on high 4 hours. reserve 1/2 cup broth and discard the rest. set to on high for an additional 30 minutes. Makes 3 cups chicken.